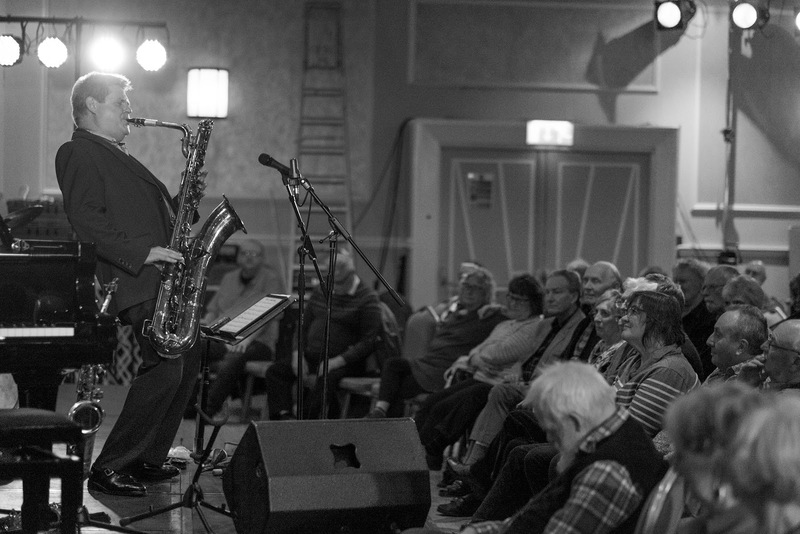 Derek Nash (saxophones, percussion), David Newton (piano), Geoff Gascoyne (bass), Clark Tracey (drums). A slight change from the band in the programme with Clark Tracey at the drum stool. The introduction described them all as world famous and they were seriously swinging from the off, Nash himself, the hat-trick of superb reeds men, kicking off on alto. In shirts, three jackets and a tie this was old-school and impeccably executed. Something he co-wrote with his dad but I regret I missed the title, found him on un-straightened soprano and I confess I prefer the look of the straight variety. He also played a couple of percussion items, on this occasion bringing a bit of a cocktail feel. All the Things You Are, as interpreted by Mulligan/ Desmond inevitably put him on baritone. It featured a great solo piano interlude and a fine bass solo, one of perhaps too many for my own personal preference. Li’l Darlin’ by Basie and he claimed they were breaking all the rules starting with a drums solo. If I had a reservation about the gig it would be that it stuck a little too steadfastly to the rules, although they did it brilliantly. 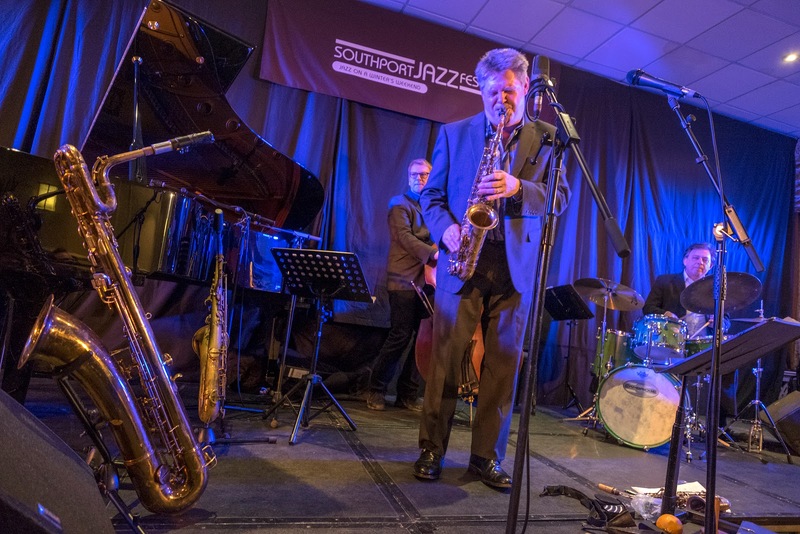 Thirty-odd years ago, when I first started going to straight ahead Jazz gigs (as opposed to Jazz Funk), this would have totally blown me away, but nowadays my preference is more for stuff a bit further 'out there'. Love at First Sound opened set two, from his award winning album Joy Riding, which he admitted to being very proud of, and justifiably so from what we heard tonight. This beautiful ballad had him back on baritone with some lovely piano touches and the excellent Dave Newton prevalent throughout the gig. You Gotta Dig it to Digit, you Dig, a reference to Monk, and title of his latest album brought the first set to an end. Keep it to Yourself, I think he said by bass player Gascoyne, marked a barnstorming return. A Latin piece with a Latin title I couldn't understand, and the absence of a singer necessitated some audience participation and we were more than happy to help out, some seriously impressive hand work from Tracey and the leader back on alto. He'd described the show as a journey through his saxophone collection and, while I've always championed soprano and especially baritone, I'm aware that this may be in part, because we generally hear less. Even though I haven't made a note of tenor yet, even though he'd certainly played it, by this time I'd more or less decided it's my favourite, but now I found myself reconsidering alto. Maybe it's like choosing a favourite child. Homecoming was a gorgeous slice of something, dare I say, close to smooth Jazz, Voodoo Rex from the tradition of New Orleans and ending with Bad Diddley or Bo Didley Clap(along), definitely sounding like something I might know with a different hat on. 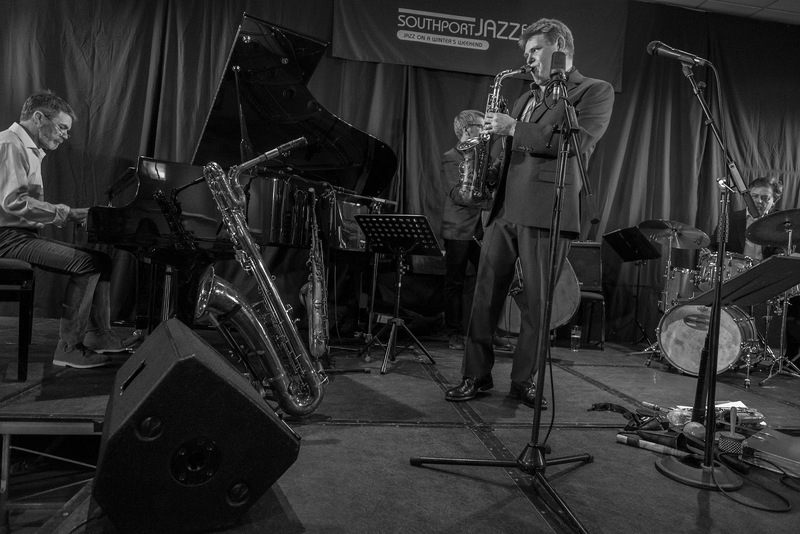 Four more great musicians, another super show, Nash like a Michael McIntyre on Jazz. A tad straighter than my preference stopped it being a highlight of the festival, already shaping up to be a classic, but well within my spectrum, and indicative of the significant range of styles over only two days I was there and eight bands I saw.